Eight years ago we welcomed a Benedictine sister from South Korea who would spend a year with us, primarily to improve her English--and as a sideline, to experience monastic life in another culture/country. 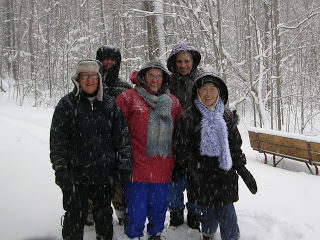 As part of her "Erie experience" a group of us decided one snowy weekend that we'd gather up some sleds and saucers and take her down to Glinodo for a sledding adventure. Now, not one of us was under 50 so I jokingly (yet half seriously) asked if I should call Emergi-care right away so they'd be there with their ambulance when the first one of us sprained something either on the way down or on the way back up the hill---or---should I wait to call them when it actually happened. Not IF, but WHEN. Ha ha ha, we all laughed. Here's a picture of the sledding gang, before the downhill experience, which, much to all our surprise we survived with nary one sprained ankle, a single bruise or the promised call to Fairfield for a winter rescue. Flash forward to this week--same place, same time, different country represented. Our yearlong (and delightful) resident from always sunny Mexico is talked into a rite of passage--building a snowman following our first snowstorm of the season. The culprit was another yearlong resident, not from Mexico or Korea, but from one of the snow capitals of the USA: Minnesota, for goodness sakes. Here they are before and after. Great, great fun was had by all--especially the onlookers and snowman admirers from inside the community room! Relief from the holiday mayhem!